Comparisons have been drawn between the attack and the killing of a British soldier earlier this week. 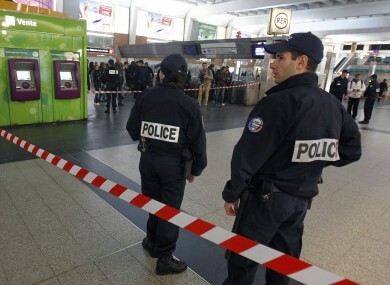 A FRENCH SOLDIER was stabbed in the neck in a busy commercial district outside Paris earlier today, and the government said it was trying to determine if there were any links to the brutal killing of a British soldier by suspected Islamic extremists. French President Francois Hollande said the identity of the attacker, who escaped, was unknown and cautioned against jumping to conclusions about the assault on the uniformed soldier in the La Defense shopping area. The life of the 23-year-old soldier is not in danger, the Interior Ministry said in a statement. Cedric Cordier is in hospital in a stable condition. On Wednesday, British soldier Lee Rigby, 25, was viciously stabbed on a London street in broad daylight in a suspected terrorist attack that has raised fears of potential copycat strikes. The French soldier was on a group patrol as part of a national protection program when he was attacked from behind, prosecutor Robert Gelli told Europe 1 radio. The assailant did not say a word, Gelli said. Rigby was attacked while walking outside the Royal Artillery Barracks in the Woolwich area of south London. The gruesome scene was recorded on witnesses’ cellphones, and a video emerged in which one of the two suspects – his hands bloodied – boasted of their exploits and warned of more violence as the soldier lay on the ground. Holding bloody knives and a meat cleaver, the suspects waited for police, who shot them in the legs, witnesses said. French security forces have been on heightened alert since their country launched a military intervention in the African nation of Mali in January to regain territory seized by Islamic radicals. British Prime Minister David Cameron was himself in Paris meeting with Hollande when he first received word of the London attack. Last year, three French paratroopers were killed by a man police described as a French-born Islamic extremist who then went on to strike a Jewish school in the south of France, killing four more people. Email “French soldier stabbed in neck outside Paris”. Feedback on “French soldier stabbed in neck outside Paris”.